Standard—a statement of required, mandatory, or specifically prohibitive practice regarding a traffic control device. The verb “shall” is typically used. Guidance—a statement of recommended, but not mandatory, practice in typical situations, with deviations allowed if engineering judgment or engineering study indicates the deviation is appropriate. The verb “should” is typically used. Option—a statement of practice that is a permissive condition and carries no requirement or recommendation. The verb “may” is typically used. Support—an informational statement that does not convey any degree of mandate, recommendation, authorization, prohibition, or enforceable condition. Most states have, at some level, developed their own sets of standards for traffic control devices, but these must substantially conform to the Federal MUTCD. The map below was developed by the FHWA’s MUTCD Team and summarizes information on which states have adopted (1) the national MUTCD, (2) the national MUTCD along with a state-specific supplement, or (3) a state-specific MUTCD. U.S. map showing states’ adoption of MUTCD. Enhanced Sign Conspicuity Methods and Devices. Pedestrian Traffic Control Devices (including signs, markings and beacons). Many of these devices are identified as “treatments” in the UIIG (see Types of Treatments), and there are corresponding fact sheets within the UIIG Toolkit. The fact sheet concisely describes the treatment (i.e., the device) and the conditions under which it would or would not be applicable, as well as provides links to resources for additional information and photographs depicting actual applications. Regulatory—providing notice of traffic laws or regulations. Warning—providing notice of a situation that might not be readily apparent. Guide—providing route designations and information to lead drivers to their destinations in a direct manner. Signs of each type that are relevant to unsignalized intersections are presented below. The two regulatory traffic control devices for unsignalized intersections are the YIELD and STOP signs, with the latter control being more common. These signs convey the traffic control for the intersection and what the users are required to do. The conditions under which a STOP or YIELD sign would be used are discussed in the UIIG’s Selection of Appropriate Control. On an intersection approach controlled by a YIELD sign (R1-2), the motorist should slow down and be prepared to stop to concede the right-of-way to other users near or within the intersection. The YIELD sign may be used at unsignalized intersections where conditions are such that a full stop is not always required. Roundabouts and mini-roundabouts represent the only intersections at which YIELD signs are installed along all approaches, as approaching traffic is required to yield to traffic within the circular roadway. YIELD signs can be used to designate the right-of-way at standard unsignalized intersections and for roundabouts. Source VHB. Other than for all approaches to a roundabout, YIELD signs shall not be placed on all of the approaches to an intersection, as there is no ALL WAY plaque for YIELD signs. There are other situations and special cases where a YIELD sign is appropriate, but these are not relevant to a typical unsignalized intersection. Example of EXCEPT RIGHT TURN plaque. Source: VHB. All road users encountering a STOP sign (R1-1) on their approach to the intersection are required to come to a complete stop before entering the intersection and then may proceed if there are no other users close to or within the intersection. The STOP sign is usually installed on each approach of the minor street, which is typically the lower-volume street. 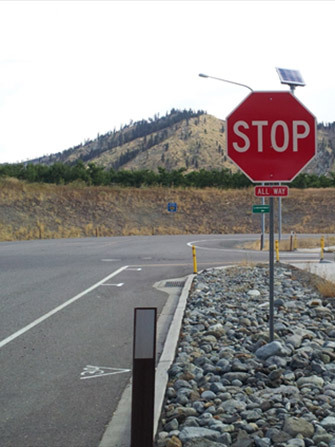 If the requirement to stop is to be applied to all approaches, then a STOP sign is installed on all approaches and supplemented with an ALL WAY (R1-3P) plaque beneath the STOP sign. Guidance on when all-way stop control is appropriate is discussed in the UIIG’s Selection of Appropriate Control. The EXCEPT RIGHT TURN (R1-10P) plaque may be installed beneath the STOP sign if the intersection geometry and traffic volumes are conducive to right-turning traffic safely entering the intersection without stopping. If this sign is used, then the intersection leg that is required to stop should have the warning sign TRAFFIC FROM LEFT (RIGHT) DOES NOT STOP (W4-4aP). An Intersection Control Beacon (Section 4L.02) is a device that contains one or more signal faces directed toward each approach to an intersection. If used, flashing circular red signal indications are applied to all approaches having a STOP sign; if not an all-way stop, flashing circular yellow signal indications are applied to the approaches (usually along the major street) that are not under stop control. The Intersection Control Beacon is generally located over the center of the intersection. This device is typically used where the traffic volumes or physical conditions do not justify a conventional traffic signal, but crash rates indicate the possibility of a special need. Example of an Intersection Control Beacon. Source: VHB. Combination No U-Turn/No Left Turn (R3-18). Mandatory Movement Lane Control Signs (R3-5, R3-5a, R3-7 and R3-20). Optional Movement Lane Control Sign (R3-6). Advance Intersection Lane Control Sign (R3-8 series). These signs are more commonly used at signalized intersections, but they may be appropriate at some unsignalized intersections depending upon the configuration. The DO NOT ENTER (R5-1) sign is to be used where traffic is prohibited from entering a roadway, which could occur at an unsignalized intersection where one or more of the approach legs has one-way traffic. This sign should be used at intersections where the major road is divided and the median width is 30 feet or more. At these locations, motorists turning right or left from the side street may not realize that the adjacent lanes are one-way in the oncoming direction and may mistakenly turn into those lanes. In this situation, the WRONG WAY (R5-1a) sign may be installed as a supplement to and downstream of the DO NOT ENTER sign. A typical application is shown in Figure 2B-12. Roundabout Directional Arrow (R6-4 series) sign—Placed in the central island, this sign has two (R6-4), three (R6-4a), or four (R6-4b) black chevron symbols pointing to the right to direct traffic counterclockwise around the central island (see Section 2B.43). The ONE WAY (R6-1 and R6-2) sign may also be used in lieu of or in addition to this sign. The two-chevron sign is suggested facing a one-lane approach to the roundabout, and either a three- or four-chevron sign is suggested facing an approach of two lanes or more. Roundabout Circulation (R6-5P) plaque—This sign is recommended when the central island does not provide a reasonable place to install the Roundabout Directional Arrow sign, but it may be used even if that sign is used. It is installed beneath the YIELD sign. Examples of roundabout signing are shown in Figures 2B-21, -22, and -23. When the STOP or YIELD sign itself is not visible for a sufficient distance to permit the road user to respond to the device, then an appropriate Advance Traffic Control sign—the symbolic Stop Ahead sign (W3-1) or the symbolic Yield Ahead sign (W3-2)—is required. The table below shows the minimum required visibility distance to the STOP or YIELD sign and the minimum distance from the STOP or YIELD sign that an Advance Traffic Control sign should be placed if that visibility distance is not available as a function of the posted or 85th percentile speed of an intersection approach. 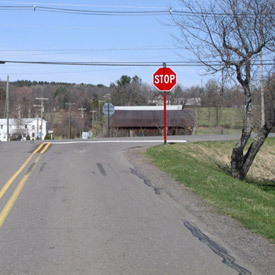 For example, if the posted or 85th percentile speed is 35 mph, then the motorist should be able to see the STOP or YIELD sign at least 250 feet in advance of the STOP or YIELD sign; if such sight distance is not available, then the Stop Ahead or Yield Ahead sign should be placed 100 feet in advance of the intersection. Minimum Visibility Distances for Placement of Advance Traffic Control Signs. Engineering judgment should be exercised when placing the warning signs, as the distances above can be adjusted for roadway features, other signing, and to improve visibility. The placement of the warning sign should be such that the Perception-Response Time (PRT) is adequate to allow motorists to detect, recognize, decide, and react to the condition of which they are being warned. Warning signs should not be placed too far in advance of an intersection. The values above are meant to serve as an aid for placing advance warning signs and do not provide a precise measurement. As described in Section 2C.46, there are several variations of the Intersection Warning sign to address a variety of intersection configurations. The Cross Road (W2-1) symbol, Side Road (W2-2 and W2-3) symbol, and Y-Symbol (W2-5) signs may be used in advance of the intersection to indicate the presence of an intersection and the possibility of turning or entering traffic. These signs are optional and are intended for the major road traffic that has the right-of-way. If the side roads are not opposite of each other, the Offset Side Roads (W2-7) symbol sign should be used instead of the Cross Road symbol sign. If the side roads on the same side are closely spaced, the Double Side Roads (W2-8) symbol sign should be used instead of the Side Road symbol sign. The T-Symbol (W2-4) sign is applicable for warning of a T-intersection for traffic approaching from the stem and controlled by a STOP or YIELD sign. The Circular Intersection (W2-6) symbol sign may be installed in advance of a circular intersection and can have a ROUNDABOUT (W16-17P) or TRAFFIC CIRCLE (W16-12P) plaque mounted below the sign. The MUTCD does not require these warning signs and does not provide any guidance as to when they should be considered. Limited visibility to or a perceived lack of awareness of the intersection and a history of crashes at an intersection would be justifications for the use of Intersection Warning signs. The Advance Street Name (W16-8 or W16-8aP) plaque may be used with any Intersection Warning sign or Advance Traffic Control sign. Such plaques are used to “provide road users with advance information to identify the name(s) of the next intersecting street to prepare for crossing traffic and to facilitate timely deceleration and/or lane changing in preparation for a turn” (see Section 2C.58). Although their use at unsignalized intersections is not required by the MUTCD, Advance Street Name plaques can be helpful to unfamiliar drivers, especially at unsignalized intersections with exclusive turn lanes. At intersections that are often mistaken by motorists to be under all-way STOP control, further clarification may be needed to warn of oncoming traffic that is not required not stop. As described in Section 2C.59, plaques mounted below a STOP sign to deliver such a warning include CROSS TRAFFIC DOES NOT STOP (W4-4P), TRAFFIC FROM LEFT (RIGHT) DOES NOT STOP (W4-4aP), and ONCOMING TRAFFIC DOES NOT STOP (W4-4bP). Street Name (D3-1 or D3-1a) signs have a very basic function—to identify the name of the street or road for all road users, especially emergency responders and those unfamiliar with the intersection. The MUTCD (see Section 2D.43) provides the following statement about Street Name signs: “Street Name (D3-1 or D3-1a) signs should be installed in urban areas at all street intersections regardless of other route signs that might be present and should be installed in rural areas to identify important roads that are not otherwise signed.” While Street Name signs are not required by the MUTCD, they do provide important guidance by identifying to the unfamiliar user both the name of street on which they are traveling and the names of intersecting streets along that route. Street Name signs may also provide block numbers. One Street Name sign is typically sufficient for smaller intersections, but multiple Street Name signs—on opposite corners (diagonally)—may be desirable for larger intersections. Size and letter heights are two important design features of the Street Name signs. The MUTCD recommends that the lettering on post-mounted Street Name signs be composed of initial uppercase letters followed by lowercase letters. The MUTCD’s recommended minimum letter heights are shown in the table below. MUTCD-Recommended Minimum Letter Heights for Street Name Signs. *On local two-lane streets with speed limits of 25 mph or less, 4-inch initial uppercase letters with 3-inch lowercase letters may be used. Increase the size of a standard regulatory, warning, or guide signs. The sizes of the signs are based primarily on the type of road and are found in the MUTCD in Tables 2B-1 (regulatory signs), 2C-2 (warning signs) and 2D-1 (conventional road guide signs). Note that the tables provide minimum and oversized options. Doubling-up of a standard sign by adding a second identical sign on the left-hand side of the roadway, as depicted below. If this is done, a double yellow centerline should be used to emphasize that the street is for two-way traffic. Example of a location with double warning signs. Source: SCDOT. Add a solid yellow or fluorescent yellow rectangular plaque above a regulatory sign comprised of yellow or fluorescent yellow material with black letters stating “NOTICE” (W16-18P), “STATE LAW,” or “NEW” and having the same width as the standard sign. The NEW (W16-15P) plaque is meant to be temporary and must be removed six months after installation of the new regulation. Example of a NEW plaque above a STOP sign. Source: VHB. Add red or orange flags to the standard regulatory or warning sign placed at 45 degrees to the vertical and made of either cloth or retroreflective material. Add a Warning Beacon (Section 4L.03) for standard regulatory or warning signs. Example of a Warning Beacon accompanying an overhead warning sign. Source: VHB. Example of a Stop Beacon. Source: VHB. Add a Speed Limit Sign Beacon (Section 4L.04) to a standard Speed Limit sign. Example of a speed limit sign beacon. Source: VHB. The border of a regulatory or warning sign may be enhanced through light emitting diode (LED) units, as detailed in Section 2A.07. See FHWA’s technical summary, Embedded LEDs in Signs, for more information. Examples of LEDs within regulatory (left) and warning (right) signs. Sources: WSDOT (left) and VHB (right). An option exclusive to warning signs is to include a 3-inch-wide border of yellow, fluorescent yellow, or diagonally striped black and yellow retroreflective sheeting on the sign perimeter. Add a strip of retroreflective material to the sign support in compliance with the provisions of Section 2A.21. Example of a retroreflective panel on a STOP sign. Source: PennDOT. A sign’s conspicuity may also be enhanced by removing non-essential and illegal signs from the right-of-way, as noted in Section 1A.08. The MUTCD includes several types of pavement markings placed on roadways to convey regulations, guidance, or warnings to the road user. The marking types include pavement and curb markings, delineators, colored pavements, channelizing devices, and islands. Those that are applicable to unsignalized intersections are summarized below. Left- and right-turn lanes—see MUTCD Figure 3B-11. Line extensions through intersections (dotted lines)—used when connecting through lanes are offset or when it is desired to delineate the travel path for turning maneuvers that may not be obvious or comprise multiple turn lanes; see Figure 3B-13 for several conditions for which these may be appropriate. While not required by the MUTCD, stop lines (also known as “stop bars”) may be used to indicate the point behind which vehicles are required to stop in compliance with a STOP sign or a Stop Here for Pedestrians (R1-5b, R1-5c) sign. Stop lines are typically at least 12 inches wide and are to be placed at the desired stopping point. If there is a crosswalk, the stop line is to be placed at least 4 feet in advance of it. More information about stop lines can be found in Section 3B.16. Yield lines (see MUTCD Figure 3B-16) consist of a row of solid white isosceles triangles pointing toward approaching vehicles extending across approach lanes to indicate the point at which the vehicles are required to yield. As with stop lines, yield lines are not required by the MUTCD but may be used to indicate the appropriate yield point in association with a YIELD sign or a Yield Here to Pedestrians (R1-5, R1-5a) sign. They are sometimes used before marked crosswalks and on the approach lanes for roundabouts. Example of yield lines in advance of a crosswalk. Source: Lee Engineering, LLC. Example of yield lines at a roundabout. Source: VHB. STOP—This word message, which is to be white and should be at least 6 feet in height, shall not be used on the pavement unless accompanied by a stop line and STOP sign. YIELD—There is no standard or guidance in the MUTCD on the use of this message but it should be accompanied by a YIELD sign; it is not required to have the yield line. RIGHT (LEFT) TURN ONLY—While use of these three words is permitted, the message that an intersection approach lane is to be used exclusively for turning maneuvers is often conveyed using: (1) the appropriate (i.e., left or right) lane-use arrow marking; or, (2) the appropriate lane-use arrow marking and the word ONLY. Lane-use—Lane-use arrow markings (see Figure 3B-24) are used to indicate the mandatory or permissible movements in certain lanes approaching an intersection. Example of STOP AHEAD pavement markings. Source: SCDOT. YIELD AHEAD word message or Yield Ahead triangle symbol—As with the STOP AHEAD pavement marking, there is no guidance on when either of these word/symbol markings should be used, but the MUTCD specifies that the YIELD sign has to be in place at the intersection. Figure 3B-26 shows the design of the Yield Ahead triangle symbol. SCHOOL XING or SCHOOL—There is no explicit guidance in the MUTCD as to when this word message is to be used. One potential application would be in advance of a marked crosswalk on the major street at an unsignalized intersection used as a school crossing. PED XING—There is no guidance in the MUTCD for this word message, but it may be considered where there is a high volume of pedestrians crossing the major street at an unsignalized intersection. 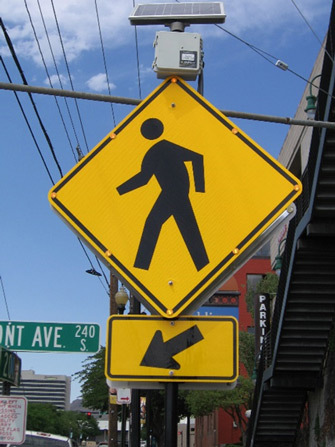 The MUTCD specifies regulatory signs that apply to unsignalized pedestrian crosswalks. The Yield Here to Pedestrians (R1-5 or R1-5a) sign and the Stop Here for Pedestrians (R1-5b and R1-5c) sign are intended for use on the uncontrolled multilane approaches to indicate where motorists are to yield or stop even if the yield or stop lines are not used. The Stop Here for Pedestrians sign shall only be used where the law specifically requires that a driver must stop for pedestrians in a crosswalk, which should be marked. The In-Street Pedestrian Crossing (R1-6 or R1-6a) sign or the Overhead Pedestrian Crossing (R1-9 or R1-9a) sign may be used to remind road users of laws regarding the right-of-way at an unsignalized pedestrian crosswalk. In addition, there are several crossing warning signs that may be used in advance of or at pedestrian crossings. An option allowed by the MUTCD is the use of a fluorescent yellow-green background color for non-motorized signs or plaque, including pedestrian signs (W11-2, W11-9, and W11-15) and bicycle or trail crossing signs (W11-1, W11-15 or W11-15P). All school warning signs shall have a fluorescent yellow-green background color. Part of a roadway at an intersection included within the connections of the lateral lines of the sidewalks on opposite sides of the highway; or, in the absence of a sidewalk on one side of the roadway, the part of a roadway included within the extension of the sidewalk. Example of a marked crosswalk. Source: Lee Engineering, LLC. Any portion of a roadway at an intersection or elsewhere distinctly designated as a pedestrian crossing by pavement marking lines on the surface, which might be supplemented by contrasting pavement texture, style, or color. The first condition specifies that a crosswalk exists at an intersection if there is a sidewalk on either side, regardless of the existence of a marked crosswalk. At unsignalized intersections, crosswalk markings can be used on all approaches, including the main road that is not controlled by a STOP or YIELD sign. However, when applied on the uncontrolled road, consideration should be given for the optional use of complimentary regulatory or warning signs—Stop Here For (Yield Here To) Pedestrians (R1-5, R1-5a, R1-5b, or R1-5c), In-Street Pedestrian Crossing (R1-6or R1-6a), or Overhead Pedestrian Crossing (R1-9 or R1-9a) sign. At locations with STOP signs to direct pedestrians to those crossing locations and to prevent vehicular traffic from blocking the pedestrian path when stopping for a STOP sign. At unsignalized street crossing locations in designated school zones. Use of adult crossing guards, school signs and markings, and/or traffic signals (when warranted) should be considered in conjunction with the marked crosswalk, as needed. At unsignalized locations where engineering judgment dictates that the number of motor vehicle lanes, pedestrian exposure, average daily traffic (ADT), posted speed limit, and geometry of the location would make the use of specially designated crosswalks desirable for traffic/pedestrian safety and mobility. Where the speed limit exceeds 40 mph. On a roadway with four or more lanes without a raised median or crossing island that has (or will soon have) an average daily traffic (ADT) volume of 12,000 vehicles or greater. On a roadway with four or more lanes with a raised median or crossing island that has (or will soon have) an ADT volume of 15,000 vehicles or greater. Example of a Pedestrian Hybrid Beacon. Source: Lee Engineering, LLC. If a traffic control signal is not justified under the signal warrants and if gaps in traffic are not adequate to permit pedestrians to cross, or if the speeds of vehicles approaching on the major street are too high to permit pedestrians to cross, or if pedestrian delay is excessive, on the basis of an engineering study that considers major-street volumes, speeds, widths, and gaps in conjunction with pedestrian volumes, walking speeds, and delay. For a major street where the posted or statutory speed limit or the 85th percentile speed is 35 mph or less, if the engineering study finds that the plotted point representing the vehicles per hour on the major street (total of both approaches) and the corresponding total of all pedestrians crossing the major street for one hour (i.e., any four consecutive 15-minute periods) of an average day falls above the applicable curve in Figure 4F-1 for the length of the crosswalk. For a major street where the posted or statutory speed limit or the 85th percentile speed exceeds 35 mph, if the engineering study finds that the plotted point representing the vehicles per hour on the major street (total of both approaches) and the corresponding total of all pedestrians crossing the major street for one hour (i.e., any four consecutive 15-minute periods) of an average day falls above the applicable curve in Figure 4F-2 for the length of the crosswalk. When a pedestrian hybrid beacon is used, there must be a marked crosswalk, and it should be used in conjunction with signs and pavement markings to warn and control traffic. A CROSSWALK STOP ON RED (R10-23) sign shall be mounted adjacent to a pedestrian hybrid beacon face on each major street approach. Additional requirements and guidance related to pedestrian hybrid beacons can be found in Chapter 4F of the MUTCD. Although the MUTCD states that “The pedestrian hybrid beacon should be installed at least 100 feet from side streets or driveways that are controlled by STOP or YIELD signs,” it is not a “shall” condition, and the National Committee on Uniform Traffic Control Devices voted to delete that guidance in the next MUTCD. Example of a Rectangular Rapid Flashing Beacon. Source: Lee Engineering, LLC. Another device that may be used to assist pedestrians crossing in a marked crosswalk at an unsignalized intersection is a rectangular rapid flashing beacon (RRFB). An RRFB is a warning beacon that consists of a pedestrian crossing sign (W11-2 or S1-1), diagonal downward arrow (W16-7p) plaque, and user-activated light-emitting diodes (LEDs) using an irregular flash pattern that is similar to an emergency vehicle flasher. The LEDs remain dark until activated by a pedestrian pushbutton or by pedestrian detection. Once activated, the LEDs shall flash in an alternating 2/5 pattern. An RRFB shall not be used for crosswalks across approaches controlled by YIELD signs, STOP signs, or traffic control signals. This prohibition is not applicable to a crosswalk across the approach to and/or egress from a roundabout. In the event sight distance approaching the crosswalk at which RRFBs are used is less than deemed necessary by the engineer, an additional RRFB may be installed on that approach in advance of the crosswalk, as a Warning Beacon to supplement a W11-2 (Pedestrian) or S1-1 (School) crossing warning sign with an AHEAD (W16-9p) plaque. This additional RRFB shall be supplemental to and not a replacement for RRFBs at the crosswalk itself. For any approach on which RRFBs are used, two W11-2 or S1-1 crossing warning signs (each with RRFB and W16-7p plaque) shall be installed at the crosswalk, one on the right-hand side of the roadway and one on the left-hand side of the roadway. On a divided highway, the left-hand side assembly should be installed on the median, if practical, rather than on the far left side of the highway. An RRFB shall not be installed independently of the crossing signs for the approach that the RRFB faces; rather, it shall be installed on the same support as the associated W11-2 (Pedestrian) or S1-1 (School) crossing warning sign and plaque. The two RRFB indications shall be aligned horizontally, with the longer dimension horizontal and with a minimum space between the two indications of approximately seven inches (7 in), measured from inside edge of one indication to inside edge of the other indication. The duration of a predetermined period of operation for the RRFBs following each actuation should be based on the MUTCD procedures for timing of pedestrian clearance times for pedestrian signals. A small light directed at and visible to pedestrians in the crosswalk may be installed with the RRFB or pushbutton to give confirmation that the RRFB is indeed in operation. Additional requirements and guidance related to FHWA’s interim approval of RRFBs can be found on the MUTCD website. 1. Table 3-1. A Policy on Geometric Design of Highways and Streets. 2011. 2. Gross, F., R. Jagannathan, B. Persaud, C. Lyon, K. Eccles, N. Lefler, and R. Amjadi. Safety Evaluation of STOP AHEAD Pavement Markings. FHWA-HRT-08-043, December 2007.